This recipe is from my brother Mike Lucey. The chicken came out so juicy and tender. Even the next day the leftovers were amazing. My brother usually puts in onion, potatoes, and carrots. Since my husband and I are eating low carb, I decided to use onions and zucchini. I cut them small for the amount of cooking time and as you can see in the picture they did get a little black. Despite that the vegetables were some of the best veggies that I have ever eaten! The flavor was amazing. The next time I make this, and trust me there will be a next time, I will cut the vegetables much larger and use more of them! This recipe was easy enough that I prepared it while my two kids who are 5 and 1 /12 were playing. Thanks for an amazing recipe Mike! 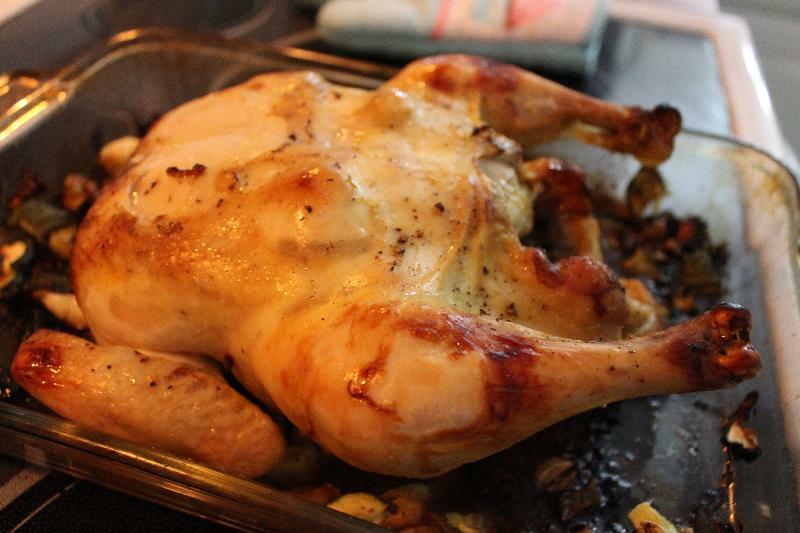 Take the chicken out of the fridge about 60-90 minutes before cooking. This will allow the meat to get to room temperature. Wash and pat the chicken dry. Remove all moisture. Sprinkle salt and pepper all in the chicken and all over the skin. Splash Worcestershire Sauce inside of the chicken cavity. Wash and cut the red potatoes, onions, and carrots. (Leave the skin on the potatoes) Place in the pan. Drizzle the honey all over the vegetables. Next sprinkle the salt and pepper over the vegetables. Crush up the Rosemary and sprinkle over the vegetables. Next place two pads of butter on top of the vegetables. Place the chicken on a rack, breast down over the veggies. (I just placed it in the pan with the veggies) I covered the chicken with foil. Cook for 60-80 minutes. Halfway through turn the chicken over. Remove when fully cooked and let rest for 10 minutes.